HI there! Maria here with your inspiration Wednesday! I found this while on Pinterest the other day and loved it. I also love sunflowers. I decided to use the Angie Girl called Sunshine Girl for my card. I added glitter glue to the sunflowers because you doesn't love some sparkle and shine. 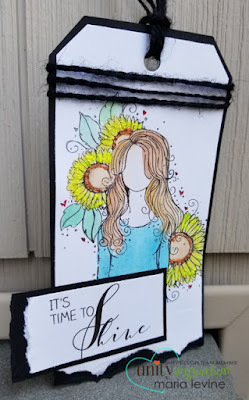 I used my Tim Holtz tag die set and watercolors to color. Thanks so much for stopping by! I hope these sunflowers inspire you today.